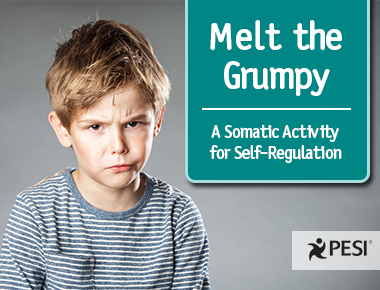 "Melt the Grumpy" is a somatic activity to help shift your emotional state with physical movement, breathing and imagery. When you are feeling irritable, or just not happy, swing both of your arms at thigh level one side to the other across your midline. This motion helps break up postural patterns and muscular tension. Using the momentum of swinging your arms with trunk rotation creates fluidity, neck rotation, visual cues and orientation. The rotation movement reinforces the somatic experience of the spine as the body’s central axis, helping to distinguish and connect both sides of the body. As you continue the exercise, the breath further moves you from "grumpy" to “emotional neutral” and over the threshold to the embodied present moment. This trauma informed approach encourages you and/or your client to find their own breathing, pace, duration and movement rhythm. When doing this activity, find an individual duration and intensity that's comfortable. Now allow yourself to get playful as you imagine the grumpiness melting like cheese. This visualization of a melting image is a great tool for helping young clients do a body scan. Have your clients complete the scan by telling them to pretend the cheese starts at their head and melts down their body carrying away the grumpy mood inch by inch as they let go. I hope this exercise helps you and your clients pour happiness into your body, wash away the cranky parts and nourish you with joy. This is awesome! It's brief and fun and works better than medicine! Thank you!